This weekend I once again asked that very question. 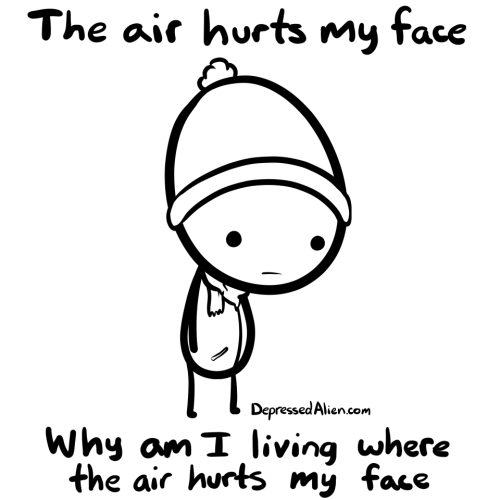 I’ve asked that question it seems more often this winter than usual. I don’t remember a winter where it was so cold and we had so many days of snow-sleet-ice of some amount. True we haven’t had the Snowmageddon of 2009 or the Icepocalypse of 2007, but in terms of numbers of days this winter it seems to have had many more days of winter junk. I, for one, am tired of it. My wife, for two is also tired of it. So naturally the conversation this evening turned to where could we live where the air doesn’t hurt our face. She brought up Costa Rica. Not sure about that one. I think Grand Cayman. Regardless of the location I asked my wife again “Why do we not live where the air doesn’t hurt our faces?” She answered, “Family.” I’m not sure that’s an acceptable answer. Perhaps it’s time to research this further.